A Cryotank Container able to transport and store 15.000 Kg (Approx.) liquid nitrogen to 10 Bar of pressure (12.500 Nm3). And a Dry Container containing four atmospheric evaporators. 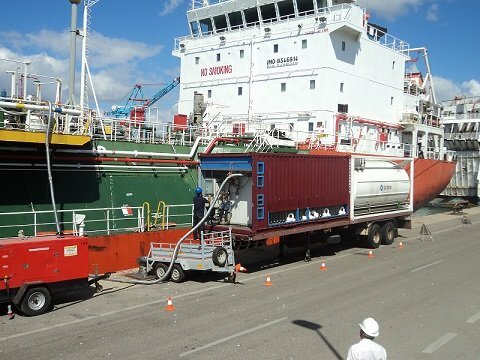 Both containers are mounted on a trailer located in Algeciras Port which can be mobilised anywhere in Spain where the services are required. (Other ports or ship yards). 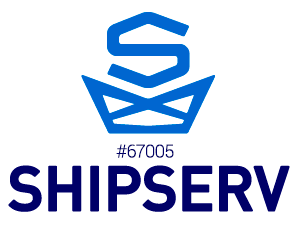 We also offer our services at Gibraltar Bay while the ship is anchored; for this operation both containers will be shipped on a barge which remains alongside your ship during supply operation. The quality of the N2 supplied: Linde standard 4.5: contents of N2 > 99.995%, H2O + O2 < 10 ppm (dew point < - 60.5ºC). Anchored in Bay - Cryotank container shipped on a barge. NOTE: The cryotank container can be refilled in situ during operations as many times as you need, we do not have restriction or limitation for the quantity of N2 to be supplied. When the ship is anchored, the time for refilling is 3 hours.